GREAT SMELLING AND ROUGH ON ODOR, BUT GENTLE ON SKIN. Skunk, cow manure, garbage, you name it. Our aromatic, mild and great smelling shampoo will get the worst odors off your animal in only one washing and without drying or irritating the animal’s skin or yours. We guarantee it! No other product on the market is making these claims or willing to back up their product like we do. 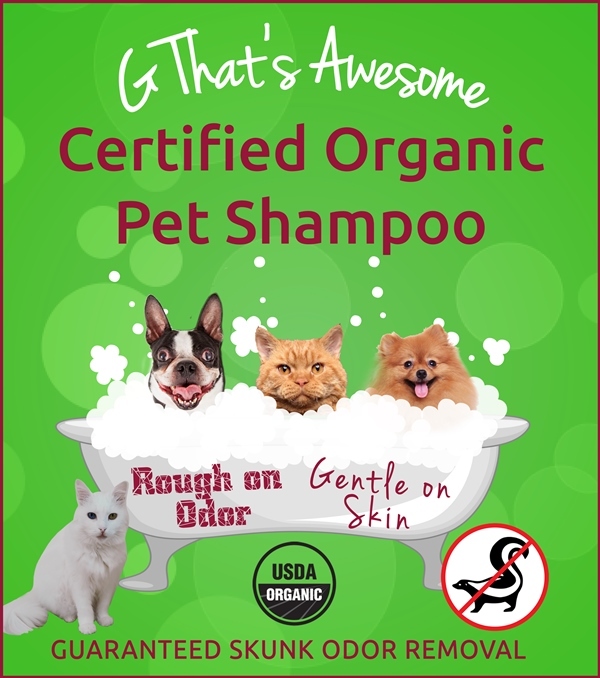 Regular use of G That's Awesome Certified Organic Shampoos will always leave your animals coat shiny, healthy and smelling great. Our product is gentle enough to be used on animals that are being treated for a skin condition and for professional groomers that do not want dry skin from washing animals all day in detergent soaps. It is also the perfect product for shelter groups that need to clean up newly rescued animals, including those with skin rashes. Many products claim to be 100% organic but only a handful have the certification to prove it. Our Awesome Shampoos were made with the finest organic ingredients and are certified to USDA (Human Grade) Standards by VOF. Not one of our ingredients was ever treated with a pesticide or is a genetically modified organism. We packaged all of our Certified Organic Shampoos in BPA-Free containers to maintain the integrity of our organic material. 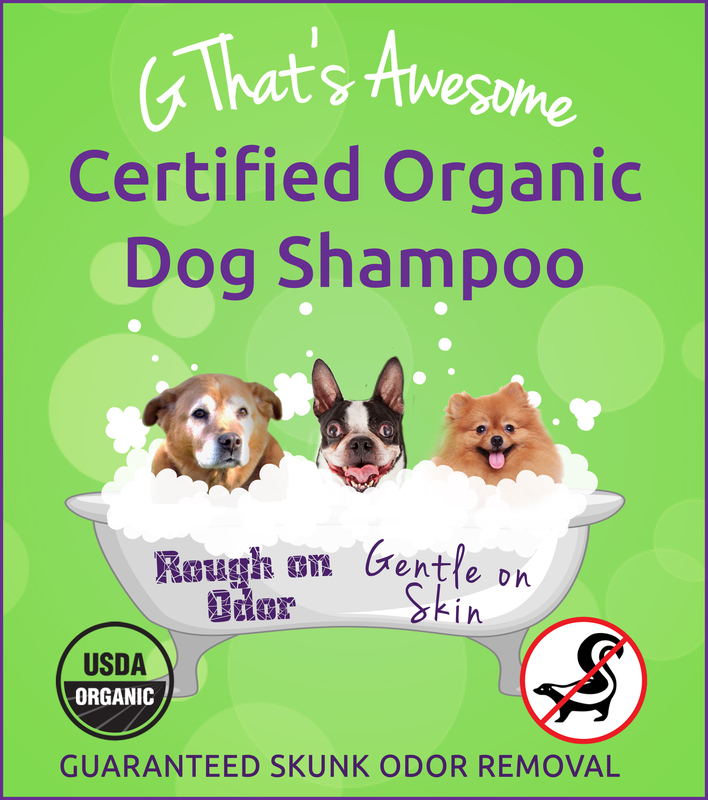 G That’s Awesome Certified Organic shampoos are proudly made in the USA, biodegradable, eco safe and environmentally friendly. OTHER SKUNK ODOR REMOVER ENCOURAGE THE USE OF RUBBER GLOVES AND HAVE EXTREME WARNINGS REGARDING THEIR USE–NOT WITH OUR SHAMPOOS! DOG ONLY FORMULA: Our Certified Organic Ingredients include: Saponified organic coconut and olive oils, calendula, hemp oil, and a natural organic essential oil blend including peppermint, rosemary and lavender. Our Dog formula is not recommended for cats as most cats do not like peppermint and many cats are allergic to lavender. PET FORMULA FOR USE WITH DOGS, CATS, BUNNIES AND GUINEA PIGS: Our Certified Organic Ingredients include: Saponified organic coconut and olive oils, and joboba, lemongrass essential oil, rosemary essential oil, organic aloe, and natural rosemary extract. All pets that can bathe can use our shampoo. This product is endorsed and recommended by StovePipeCat a.k.a StovePipe The Traveling Cat. www.StovePipeCat.com. The inspiration for our certified organic shampoo line started the day we became an Anti-Icky-Poo distributor. An animal hospital and customer called us and told us that they had an incontinent dog that had been laying in filth for several days. They washed the dog several times with several leading animal shampoo products, but could not get the odors out. They called me and asked what they should use. I was surprised that an animal hospital would be asking me this question. A few days later, another customer called and reported that their dog went out the doggie door in the middle of the night, got sprayed by a skunk, returned through the doggy door and laid on the couch. They used Anti-icky-Poo to get the odor off the couch, but did not know how to clean the dog. G THAT’S AWESOME SHAMPOOS ARE MADE IN THE USA!